- The earliest Rottweiler standard allowed various coat colors including red, blue, grey and 'tiger striped'. White markings were also common. - The average life expectancy for a Rottweiler is somewhere between 7 and 10 years. - Many Rotties 'talk'. It's a low, grumbling sort of sound - not to be confused with growling. I love it when mine do this, and it seems to me that it's a bit like a cat purring! - Rottweilers shed a lot. They may have a short coat that looks like it's wash-n-wear, but don't let that fool you. You'll need to groom your Rottie regularly and loose dog hair will become a part of your life. 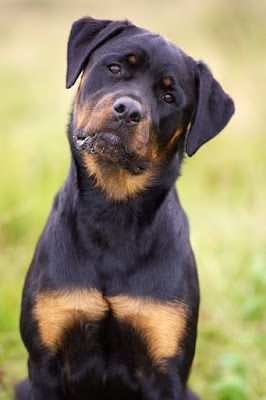 - The Rottweiler tendency to lean against people is a throw-back to the days when they were cattle drovers. They used to lean against the cattle to get them to move in a particular direction. - Between the 12th and 29th Centuries the Rottweiler was also known as the 'Metzgerhund' or 'Butchers Dog' as he was used to protect the Butchers' money on trips to and from markets. - Rotties are working dogs, and they're happiest when they have a job to do. Some activities that your dog can excel at include obedience, tracking, carting, and Schutzhund (a mixture of advanced obedience, protection and tracking. Love it when my Rottie rumbles when I scratch her back. And the leaning has been something to get used to. She can almost knock me over. Have also gotten used to her being right there with me at all times. I've almost tripped over her many times, but now know to watch where I step. I even have a picture of her head laying right between my feet as I'm washing the dishes. She's my girl!! I think I"m gonna get a pair of roller blades and let her pull me. I had a Jack Russeell Terrier who loved to do that. I'm sure my Rottie will, too. Rottweilers are the coolest dogs. Yup. Sounds like my Bruto alright.